The Federal Government will work with Google and other technology companies in the country to ensure that Nigerians have improved access to the Internet. Vice President Yemi Osinbajo said this in Lagos on Thursday at Google for Nigeria. According to him, this will enable Nigerians benefit fully from the great power the Internet offers them as creators and co-creators. “We will be partnering with Google and other technology providers to achieve the level of connectivity that will match the creativity of our people,” Professor Osinbajo said. The Federal Government has repeatedly stressed the importance of technology to the development and growth of the country. In his speech, the Vice President explained various efforts the government had made in the area of technology. For him, with Nigeria expected to have the 4th highest population in the world by 2045, technology has a huge role to play. “We cannot train nearly 200 million young people in 2045 in classrooms alone,” he said. 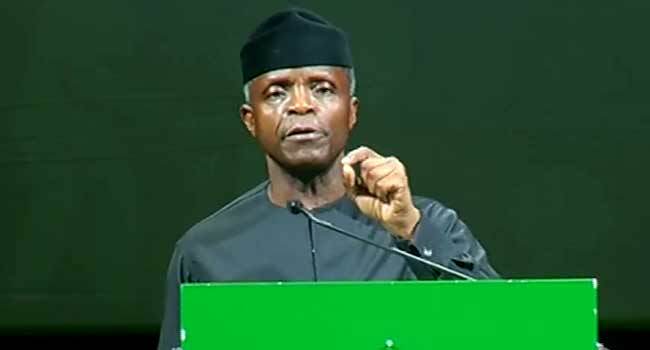 Although Professor Osinbajo expects this century to be “Africa’s century” – for good or bad, he explained that the continent is currently facing existential challenges. “Today, 60 per cent of the population of Africa are young people,” he said, stressing that unless young people are properly engaged, they would not be as productive as they can be. Among other concerns, he believes such a situation will continue to encourage a brain drain. “If social foundations remain tenuous, even the well educated will be tempted to migrate,” he said. The Vice President who praised Google for its activities in the country and globally, expects that the use of technology will play a key role in bettering the fortunes of Nigerians and Africans. “It is becoming increasingly clear that the provision of food and health care will depend on technology,” he said.